Laserfiche Records Mgt Ed. 8 Receives DoD 5015.2 Cert. Long Beach, CA, September 27, 2007– There has been an excited buzz around Laserfiche headquarters and VAR offices for the last year or so in anticipation of the new and innovative capabilities that Laserfiche will be offering with Version 8. Therefore, today was a celebratory day at Laserfiche as they announced that they had successfully fulfilled Department of Defense (DoD) 5015.2 Records Management Certification Requirements with Laserfiche 8. The DoD—along with a variety of other government agencies—will only purchase records management applications that meet the core functionality requirements outlined in standard 5015.2. Because this certification involves such rigorous testing, it has become the de facto standard for records management applications. To gather information for her report, the test officer looked at a number of modules, including Workflow, Web Access, WebLink™, Quick Fields™ and Import Agent™. 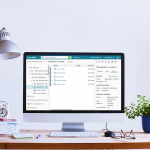 Pava says the test officer was particularly impressed with the new version of Workflow and the numerous enhancements that Laserfiche has made over earlier versions. According to Pava, the fact that Laserfiche meets the DoD’s standards for records storage, retention and destruction shows that Laserfiche has a well-designed, feature rich system that will help records managers in all industries do their jobs more effectively. “Just as important, the certification marks an important milestone in the development of Laserfiche 8, because it shows that Laserfiche 8 is as intuitive and easy-to-use as earlier versions of the software, yet can stand up to rigorous outside testing,” Pava said. Laserfiche® (www.laserfiche.com) creates simple and elegant document management solutions that help organizations run smarter. Since 1987, more than 25,000 organizations—including numerous federal, state and local government agencies and departments—have used Laserfiche software to streamline processes for managing documents, records and workflow. By digitizing paper archives, Laserfiche enables users to instantly pinpoint the information they need, collaborate more effectively and complete daily tasks more efficiently. Secure Web access allows governments to easily share information with other agencies and with constituents, while comprehensive security options protect information from unauthorized access or release. Records management functionality also ensures compliance with a range of standards, including Department of Defense (DoD) standard 5015.2.